What Is an Inciting Incident, and When Should It Occur in a Novel? It can be hard to sort through all of the writing jargon that’s out there… and even doubly hard when you’re working on beginning your novel. Simply put, the inciting incident is key to a successful novel beginning and hook in order to get readers invested in the character and story that’s about to unfold. In a literary work, the inciting incident is the moment, event, or action that pulls the main character into the main action of the story. In other words, it’s when the character gets put on the path to the plot. In this moment, the character is off balance, the status quo has been shattered, and their life will never be the same. When Should the Inciting Incident Occur in a Novel? The inciting incident typically occurs as close to the beginning of the novel as possible. It may not be the hook or the first thing that happens, but it will still be close to the beginning. Does J.R.R. Tolkien just arbitrarily start here? No. He’s consciously beginning here. This sets the scene as a contrast so that the effects of the inciting incident are stark. The inciting incident is actually when Gandalf and 12 dwarves start showing up to his comfortable hobbit hole, pressuring him to go on an adventure. This is the moment that Bilbo’s life changes for good, and it comes as close to the beginning as possible (with a bit of preamble that shows why this event was so important and strange). While the inciting incident happens in the beginning, don’t confuse it for the first plot point. In order for the rising action (the beginnings of the plot) to happen, there must be somewhere to rise from. The inciting incident is the gasoline being sprayed on the house. The first plot point is the strike of the match. The climax is the inferno. In The Hobbit, the inciting incident is a wizard and 12 dwarves upending Bilbo’s comfy hobbit life; the plot is the unexpected journey. With that in mind, the first plot point begins where the journey does. Whether you’re looking at the Disney version or the Lewis Carroll, we know that Alice has some crazy, tripped-out adventures in Wonderland. She doesn’t start there, though. She starts in the real world, bored. The inciting incident is seeing (and following) the white rabbit. This moment leads her to the first plot point, which is falling down the rabbit hole. Even if you think of the Tim Burton movie, the first plot point is falling down the rabbit hole, but the inciting incident is the party and proposal, which shakes her world and makes her more inclined to follow that rabbit. While I’m not a fan of the movie, I’d argue that this is a stronger inciting incident than in the books because Alice has more cause to run away than simply being bored (and drama is good). Rose Madder by Stephen King is about a woman who is abused by her husband and gets away. The husband has a preternatural sense for tracking people down, so he is hot on her heels. We know that victims have reasons why they do not or cannot leave their abusers. In Rose Madder, she endures her situation for who knows how long. Then, one morning, she sees a drop of blood on her pillow case, and this shakes her to her core, causing a mindset shift that she must leave him. The take-away here is that the inciting incident doesn’t have to be a big moment, but it does have to be pivotal. The inciting incident is the moment she sees the blood. The first plot point is when she leaves, and the rising action is her escape leading up to the climax of their confrontation. A classic Halloween movie. The first plot point is when the boy lights the black flame candle, releasing the witches from their death and/or residence in another dimension. However, the movie begins earlier with the boy and his kid sister experiencing their new school for the first time. This is a situation in which the status quo has been changed. The inciting incident, their sucky first day at a new school, puts them off-balance, which in turn puts them on the path toward the plot. 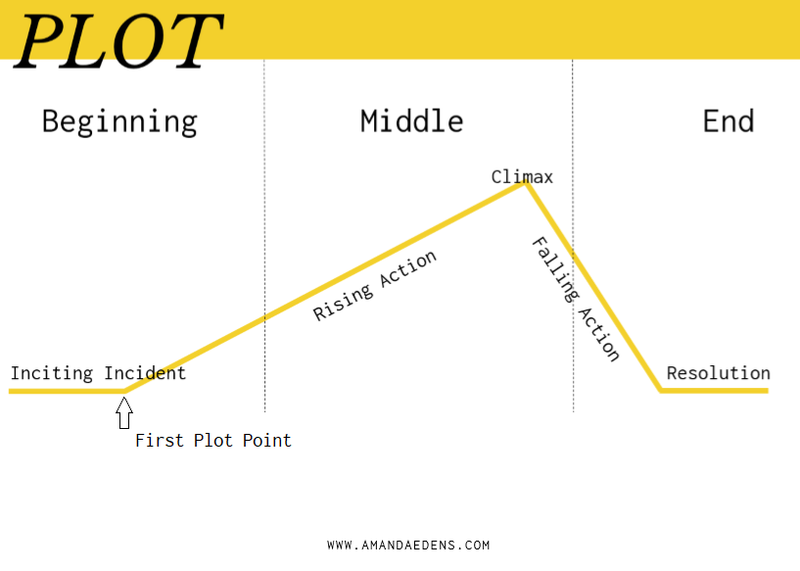 Have you started your novel at the first plot point? Or do you have an inciting incident to set the stage for the rising action? What moment is your character changed and off-balance? How does that status-quo-shattering moment put them on the path toward the plot? These will be the keys to crafting a great beginning. Watch the plotting video for more information about inciting incidents and plot structure. Download the character profile exercise to help identify the inciting incident and conflict. Previous Post How Much Does a Book Editor Cost?